13th century sculptures from the west rood screen of Naumburg Cathedral, Germany. The Lutheran Reformation did not simply destroy what came before it. The Confessions make it clear that we retain and preserve what we can according to the Gospel: “the usual public ceremonies are observed, the series of lessons, of prayers, vestments, and other such things” (Apology XXIV:1). In many cases this applied to the visual arts as well. While Great Britain and Switzerland bear the scars of Reformed iconoclasm, many churches in Lutheran Germany still display the beauty of medieval Christianity. 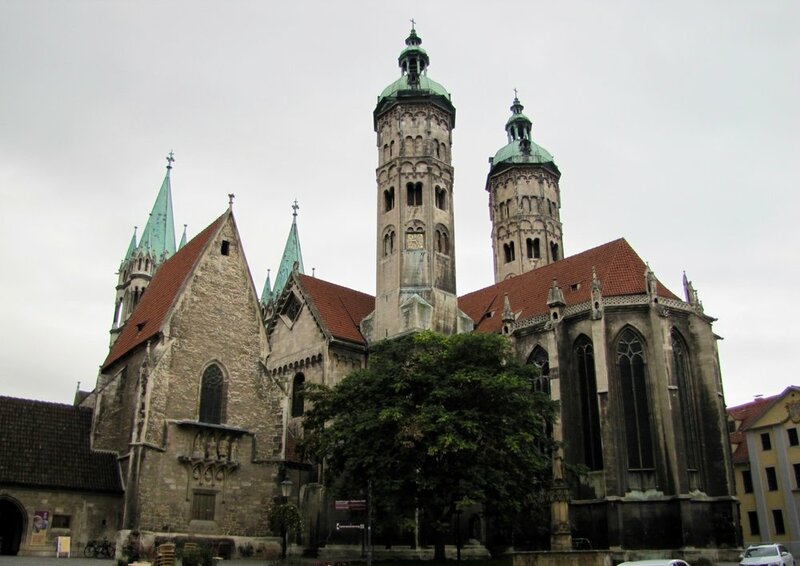 One excellent example of this preservation (and of early Gothic architecture) is the cathedral in Naumburg. The majority of the cathedral is from the mid-13th century, including the famous west rood screen. Along the top of the screen are panels depicting the Passion of our Lord, while the doorway is dominated by the crucifixion itself. The crucified Christ is flanked by His blessed mother Mary (left) and His beloved apostle John (right). Above the arms of the cross are two angels offering incense in adoration of the Lord and His sacrifice. The thuribles themselves are a reminder of the Lutheran retention of this ceremony in many places. West rood screen in Naumburg Cathedral. Besides being a stunning memorial to medieval art, Naumburg Cathedral has an interesting place in Reformation history. Luther himself visited this church, where he consecrated his colleague Nicholas von Amsdorf as the first Lutheran bishop in 1542. It is intriguing to imagine the great reformer gazing upon these very sculptures. While most Lutherans today visit the Wittenberg churches that played such important roles in Luther’s life, both the City Church and Castle Church have changed much since the 1500s, and one wonders how much Luther would recognize. Unfortunately for Bishop Amsdorf, an Imperial victory at the battle of Mühlberg in 1547 meant that he was expelled from Naumburg and a Roman bishop regained the cathedral. Finally, in 1564, Naumburg and its cathedral were officially brought under the control of the Lutheran Electors of Saxony and the Reformation was introduced permanently. Overall, the Lutheran Reformation is marked by a conservatism that acknowledges and appreciates the past, including the visual arts, provided they do not obscure the Gospel. It was always maintained that substance ranked higher than externals: “The true adornment of the churches is godly, useful, and clear doctrine, the devout use of the Sacraments, fervent prayer, and the like. Candles, golden vessels, and similar adornments are fitting, but they are not the specifically unique adornment belonging to the Church” (Apology XXIV:51). And yet, as this article confesses, external adornments “are fitting.” In fact, paintings and sculptures can be fitting servants to the proclamation of God’s Word, presenting the doctrine of Christ to the worshiper’s eyes and further impressing it upon his heart. In preserving and upholding historic liturgical art, we sing with the Psalmist, “One thing have I desired of the Lord, that will I seek after; that I may dwell in the house of the Lord all the days of my life, to behold the beauty of the Lord, and to enquire in His temple” (Psalm 27:4).